Regina, Sask. – June 28, 2016 – UFCW Canada Local 1400 and Local 649 activists were out in full force on June 25th at the annual Queen City Pride Parade in Regina. Edmonton and Winnipeg – June 9, 2016 – UFCW Canada activists were loud and proud at the Winnipeg and Edmonton Pride Parades. London, Ont. – March 7, 2016 – UFCW Canada activists recently participated in the 2016 Fierté Canada Pride conference to discuss plans for the upcoming Pride season. Ottawa – February 16, 2016 – UFCW Canada Local 1000A member-activist Danea Lau works at a Loblaws Great Food in Ottawa and is a member of the local union's Pride Advisory Group. 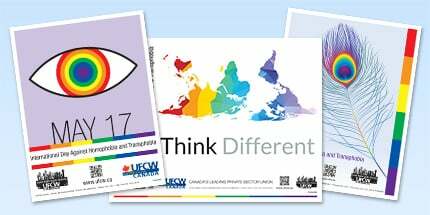 Halifax – November 11, 2015 – UFCW Canada recently attended the Canadian Professional Association for Transgender Health’s bi-annual conference in Halifax. Dubbed Transforming the Landscape of Transgender Health and Wellness, the conference included presentations from leading health care practitioners in the area of transgender health issues. Calgary – September 10, 2014 – UFCW Canada activists were loud and proud at the 25th Anniversary Calgary Pride Parade.